Baften is a verb, which means to knot in Farsi (Iran). It is used as a suffix to indicate the Rugs origin or analogy: bibibaff, sennehbaff, armenibaff, Sennehbaft. Sometimes, it is used associated to different origins. For example Sench baft means fabric as Seneh, Baft-E-Seneh means cloth from Sench. Baft is also the suffix for the Persian verb baften, to knot. It is also a town in the Iranian Kirmam Region, in the center of the Afshari settlement which collects the Rugs. Baff in Persian means knot: turkbaff, Turkish knot; farsibaff, Persian knot. Bakhtiar Rugs: with classical subjects or inspired by the Isfahan. The real Bakhtiari Rugs are nomadic Rugs of great charm and, whether ancient or old, are quite sought after and rare to find. Indigenous to the south-east area of Isfahan, the tribes who knotted these Rugs are almost all settled. Some old and antique Bakhtiari Rugs have the subject which follow the ancient Rugs of Isfahan whose influence they have acquired..
Operation that serves to give body and strength to the carpet. It is carried out during the knotting of a carpet, with a special comb for compacting the weave passed onto the rows of knots, and can be made of wood or metal. Word of Turkish origin for the small rectangular pockets, in kilim, sumak or knotted, open on the short side, used for transportation and as a pillow by Baluchi and Afghans people. Nomadic manufacture, knotted completely in wool by Afghan people transferred to the Mashad area. Their characteristics are somewhat archaic and fairly inexpensive, with tribal and simple objects named SIYA-KAR, or dark endevour, because of the colours used. Classic Afghan carpet all in wool; years ago one could find rather fine, really beautiful ones. Now, thanks to the large importers that link maximum income with minimal investment, they have become the ugliest and most commercial Rugs on the market. If you purchase one pay close attention to moths: they are rather fond of these Rugs. 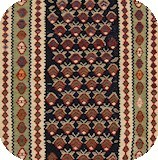 They are the most traditional and authentic among the many types of Berber Rugs. They are old manufacture Rugs, hand knotted according to the Berber knot technique, with raw wool and natural colours. Originally they were used as the floor of the tent by the nomadic Beni Ourain tribe. They are distinguished by the white background, the long and soft fleece (5-6 cm) and by its black designs. Products of the High Atlas villages. Designer artifacts knotted completely in Turkey with hand-spun wool, inspired by the old schools Beni-Ourain Berbers from Morocco of which you can find many original copies in the section on Berber Rugs in our site. They are in recent Chinese manufacture with the floral design typical of the Persian Kirmans, knotted with a cotton structure using very soft wool. They have very good finish quality and are very robust. Trade name given to the finest and refined quality of Bakhtiari Rugs. . The word consists of baft, (knot) and bibi, the name the oldest woman of the house, more expert in weaving, was called. Persian city in south-eastern Khorassan, where they began to produce Rugs from the early 900’s.